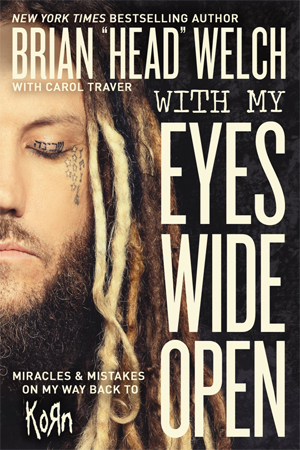 To coincide with the pre-order launch of his new book titled With My Eyes Wide Open: Miracles And Mistakes On My Way Back To Korn (due out May 17 from Nelson Books), musician and New York Times bestselling author BRIAN 'HEAD' WELCH premiered a new song this week (3/15), "Lo Lamento", from his solo band LOVE & DEATH. Fans who purchase the book at Welch's official webstore will receive a free download of the track. Stream "Lo Lamento" below. Regarding the new track, Head had this to say: ""Lo Lamento" is a song that came from an idea producer Jasen Rauch and writer Mark Holeman had on our last album, Between Here And Lost. It was actually the original chorus for our song "I W8 4 U", but it sounded way to melodic for that crushing song as you can imagine. To me "Lo Lamento" paints a picture lyrically about infidelity and a once picture perfect relationship left in ruins." With My Eyes Wide Open is the guitarist's account of the brutal, eye-opening and decade-long trial by fire after leaving KORN, from the perils of fathering a teen lost in depression and self-mutilation to the harsh realities of playing solo and surviving the shattering betrayal of a trusted friend. In this intensely inspiring redemption saga, perhaps the most inspiring is BRIAN's radical decision to rejoin KORN (surrounded by a lifestyle he almost lost everything to) and reconcile with the tribe of people he once considered family. Told with humor and no-holds-barred frankness, the raw and brutally honest follow-up to WELCH's 2007 bestseller, Save Me From Myself, will appeal to a wide range of readers. With My Eyes Wide Open is truly an inspiring story for all. Written with Carol Traver, the book is 240 pages in length, featuring 16 full color photos from WELCH's personal archive. Fans can pre-order the book at any book retailer including Amazon, Barnes and Noble, ChristianBooks.com and at Welch's official webstore. Specially priced bundled products and limited edition items from Brian 'Head' Welch and LOVE & DEATH are also available at Welch's official webstore.